Restorative justice recognizes that crime hurts everyone: victims, offenders and the community. If we’re going to build a more nonviolent world, it will mean more of us speaking up, listening closely and finding innovative ways to cooperate. This will be true for revamping structures and institutions — and it will also apply to tackling violence. In a more nonviolent world we will confront violence less by imposing punitive arithmetic — long jail sentences and paralyzing fines — than by taking deliberate steps to repair harm, meet needs, foster accountability and gamble on the idea that transformation is possible. The emerging discipline of restorative justice, simply put, will have found its way into the heart of our lives, our communities and our societies. Cynthia has since written about the experience that unfolded once she got there in her article “Soul Force” (published in Engage: Exploring Nonviolent Living). In the midst of their grief and anger, her family had been unexpectedly asked by the public defender for help. The district attorney was going to seek the death penalty — would they intervene to urge the D.A. to file charges more commensurate with the crime? As grievous as this violence was, the lawyer said, it was a stretch to call what happened a capital offense. John’s son threw the public defender out of his house. But the rest of the family wouldn’t let it go. Right there they plunged into a struggle with justice — what was just in this case? What was the right thing to do? In the end, most of them decided that they needed more information — and they could only get this from the offender. They were not, though, given easy access to him. “We bullied, badgered, threatened and made a whole lot of noise, before the attorneys would agree to set up a visit,” Cynthia writes. Finally, they got their meeting. Sitting before them was a 19-year-old named David, who, by his own admission, had been on a crime spree. On top of that, he owed someone money and was having trouble coming up with it. He was being threatened, so he had decided to rob the clinic. Ironically, he and his family had been the recipient of her uncle’s generosity — they had gotten free inoculations and other health care over the years at the center. He seemed remorseful. He also seemed resigned to whatever happened. Like his father and other family members, he would be spending years in jail. This seemed like the end of the story. But then something shifted. On the drive back home, while ruminating on this kid (“Jeez, what a loser.” “Face it, David doesn’t have a snowball’s chance in hell of turning his life around.” “He’s illiterate.” “Pathetic.”), one of Cynthia’s cousins started composing a list of book titles. By the time they got to the house, they had concocted a proposal: David had to learn to read and then plow through a long list of books, including The Autobiography of Malcolm X. He had to get his GED and, as a condition of parole, learn a trade and keep a job. For good measure, he had to do “five or ten years” of community service. When they presented their ideas to the D.A., he balked. But the family stood its ground, and the charges were reduced — and their recommended conditions were submitted to the court. David would spend years in prison, but he would not be heading to death row. The last part of the story I found unbelievable when Cynthia first told it to me — and I find it unbelievable still, after all these years. If I didn’t know Cynthia I would be skeptical. But she’s a good friend so I have to believe it. The essence is that David petitioned the court to let him attend the funeral. The request was granted and the family, incredibly, invited him to join the procession and to sit with them. After many people in the packed church offered testimonials honoring Cynthia’s uncle, David stood up. He said to the assembly, “‘A good man is dead because of what I did. I’m sorry.’ He gestured toward my cousins. ‘They spared my life. I didn’t deserve that. I’m going to be in prison for a very long time, but I’m not being sent there to die. What I want to ask all of you here is: Is there any way you can forgive me?’” The pastor asked him to kneel, and slowly the congregation came forward to prayerfully lay hands of healing on him. One by one, Cynthia’s cousins did the same, including the one who had pitched the public defender out of his house. Though Cynthia had studied nonviolence, she and her family were not schooled in the theories of restorative justice. They illuminated its key elements, however, as they struggled with a painful tragedy in a way that intuitively steered them away from retribution to restoration. Rather than leaving the matter entirely in the hands of the criminal justice system, they demanded an active role — sitting with, listening to and engaging with the perpetrator; imagining ways he might be able to turn his life around while still holding him accountable; advocating for a more transformative sentence; and astoundingly welcoming him into one of the most painfully-charged environments possible — the funeral of the victim — which, paradoxically, proved to be a space of healing and reconciliation. Restorative justice is not new — and it does not need a highly-developed theory to be experienced. But stories like Cynthia’s have fueled the dramatic emergence of restorative justice as a key to positive peace and as a powerful practice for transformation and healing. Over the past few decades its principles and techniques have increasingly been worked out, refined and applied. Restorative justice recognizes that crime hurts everyone: victims, offenders and the community. It seeks to make things right by bringing all parties together: to hear the voice and needs of the victim; to hear from the offender — why did they take the action they did and what will make this choice less likely in the future? It increases the likelihood of reintegrating the offender into the community rather than being stigmatized, shamed and more likely to reoffend. Fundamentally, it provides an alternative to two traditional responses to crime: punitive and authoritarian on the one hand or permissive and paternalistic on the other. Restorative justice lies at the heart of nonviolent transformation. We are offered opportunities in our every day lives to reach for this option (like Cynthia Stateman’s family); to study it (like academics on the one hand or the children in Pasadena on the other); or to bring its principles and dynamics to the innumerable struggles for social change that this world so decisively needs. Realistically, we understand the slim chance of beatification for Ben Salmon. But Ben Salmon’s story of conscience and the torture he endured in his refusal to train to kill could be opened to many Catholics and other Christians. I plan on being in Chicago on Good Friday for the Stations of the Cross. Could we meet sometime that day to discuss a possible ” cult” of Ben Salmon supporters in Chicago? Loved reading this; totally agree. 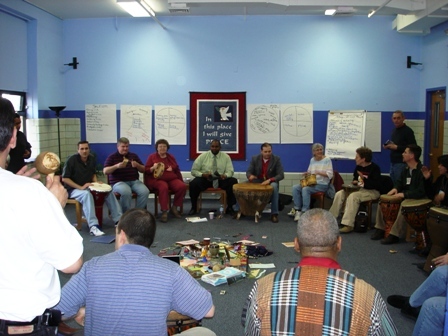 I would also warmly invite people to look into Restorative Circles. First developed by Dominic Barter in the favellas of Brazil, this model has been implemented internationally. It is based on principles of both restorative justice and Nonviolent Communication. See http://www.restorativecircles.org and check out videos on You Tube. Thank you. must ask their priests to be more courageous in preaching it. This restorative justice approach makes much more sense than the purely punishing, useless cruelty that is standard treatment for convicts in our society. I’d wager that recidivism will be incredibly reduced and prison costs and social costs will be dramatically reduced. We will be able to find better jobs for those prison guards who will not be needed because there won’t be so many prisoners. That is a much better future for California and the whole nation. Let’s make it work well. I am frequently to blogging and i certainly appreciate your content. The write-up has actually peaks my interest. I’m going to bookmark your web-site and maintain checking for new information and facts.